The virtual machine (VM) serial console in the Azure portal provides access to a text-based console for Linux virtual machines. This serial connection connects to the COM1 serial port of the virtual machine, providing access to it, independent of the virtual machine's network or operating system state. Access to the serial console for a virtual machine can be done only by using the Azure portal. It's allowed only for those users who have an access role of Virtual Machine Contributor or higher to the virtual machine. For serial console documentation for Windows VMs, see Virtual machine serial console for Windows. The serial console for virtual machines is generally available in global Azure regions. It is not yet available in Azure government or Azure China clouds. The VM in which you're accessing a serial console must use the resource management deployment model. Classic deployments aren't supported. The VM in which you're accessing a serial console must have boot diagnostics enabled. The VM in which you're accessing a serial console must have a password-based account. You can create one with the reset password function of the VM access extension. Select Reset password from the Support + troubleshooting section. For settings specific to Linux distributions, see Serial console Linux distribution availability. On the left menu, select Virtual machines. Select a VM in the list. The overview page for the VM opens. Scroll down to the Support + troubleshooting section and select Serial console. A new pane with the serial console opens and starts the connection. The serial console requires a local user with a configured password. VMs configured only with an SSH public key won't be able to sign in to the serial console. To create a local user with a password, use the VMAccess Extension, which is available in the portal by selecting Reset password in the Azure portal, and create a local user with a password. You can also reset the administrator password in your account by using GRUB to boot into single user mode. For the serial console to function properly, the guest operating system must be configured to read and write console messages to the serial port. Most Endorsed Azure Linux distributions have the serial console configured by default. Selecting Serial console in the Support + troubleshooting section of the Azure portal provides access to the serial console. Red Hat Enterprise Linux Serial console access enabled by default. CentOS Serial console access enabled by default. Ubuntu Serial console access enabled by default. CoreOS Serial console access enabled by default. SUSE Newer SLES images available on Azure have serial console access enabled by default. If you're using older versions (10 or earlier) of SLES on Azure, see the KB article to enable serial console. Oracle Linux Serial console access enabled by default. Custom Linux images To enable the serial console for your custom Linux VM image, enable console access in the file /etc/inittab to run a terminal on ttyS0. For example: S0:12345:respawn:/sbin/agetty -L 115200 console vt102. For more information on properly creating custom images, see Create and upload a Linux VHD in Azure. If you're building a custom kernel, consider enabling these kernel flags: CONFIG_SERIAL_8250=y and CONFIG_MAGIC_SYSRQ_SERIAL=y. The configuration file is typically located in the /boot/ path. If you are not seeing anything in the serial console, make sure that boot diagnostics is enabled on your VM. Broken FSTAB file Press the Enter key to continue and use a text editor to fix the FSTAB file. You might need to be in single user mode to do so. For more information, see the serial console section of How to fix fstab issues and Use serial console to access GRUB and single user mode. Incorrect firewall rules If you have configured iptables to block SSH connectivity, you can use serial console to interact with your VM without needing SSH. More details can be found at the iptables man page. Similarly, if you firewalld is blocking SSH access, you can access the VM through serial console and reconfigure firewalld. More details can be found in the firewalld documentation. Filesystem corruption/check Please see the serial console section of Azure Linux VM cannot start because of file system errors for more details on troubleshooting corrupted file systems using serial console. Interacting with bootloader Restart your VM from within the serial console blade to access GRUB on your Linux VM. For more details and distro-specific information, see Use serial console to access GRUB and single user mode. By default, all subscriptions have serial console access enabled for all VMs. You can disable the serial console at either the subscription level or VM level. To enable or disable the serial console for a subscription, you must have write permissions to the subscription. These permissions include administrator or owner roles. Custom roles can also have write permissions. The serial console can be disabled for an entire subscription through the Disable Console REST API call. 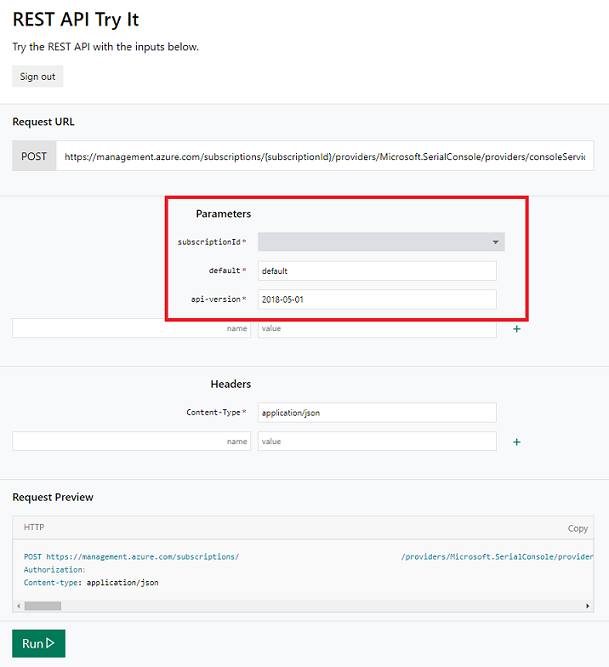 You can use the Try It function available on this API documentation page to disable and enable the serial console for a subscription. Enter your subscription ID for subscriptionId, enter default for default, and then select Run. Azure CLI commands aren't yet available. $ curl -X POST "https://management.azure.com/subscriptions/$SUBSCRIPTION_ID/providers/Microsoft.SerialConsole/consoleServices/default/disableConsole?api-version=2018-05-01" -H "Authorization: Bearer $ACCESSTOKEN" -H "Content-Type: application/json" -H "Accept: application/json" -s -H "Content-Length: 0"
$ curl -X POST "https://management.azure.com/subscriptions/$SUBSCRIPTION_ID/providers/Microsoft.SerialConsole/consoleServices/default/enableConsole?api-version=2018-05-01" -H "Authorization: Bearer $ACCESSTOKEN" -H "Content-Type: application/json" -H "Accept: application/json" -s -H "Content-Length: 0"
The serial console can be disabled for a specific VM by disabling that VM's boot diagnostics setting. Turn off boot diagnostics from the Azure portal to disable the serial console for the VM. Access to the serial console is limited to users who have an access role of Virtual Machine Contributor or higher to the virtual machine. If your Azure Active Directory tenant requires multi-factor authentication (MFA), then access to the serial console will also need MFA because the serial console's access is through the Azure portal. All data that is sent back and forth is encrypted on the wire. All access to the serial console is currently logged in the boot diagnostics logs of the virtual machine. Access to these logs are owned and controlled by the Azure virtual machine administrator. No access passwords for the console are logged. However, if commands run within the console contain or output passwords, secrets, user names, or any other form of personally identifiable information (PII), those will be written to the VM boot diagnostics logs. They will be written along with all other visible text, as part of the implementation of the serial console's scroll back function. These logs are circular and only individuals with read permissions to the diagnostics storage account have access to them. However, we recommend following the best practice of using the Remote Desktop for anything that may involve secrets and/or PII. If a user is connected to the serial console and another user successfully requests access to that same virtual machine, the first user will be disconnected and the second user connected to the same session. This means that a user who's disconnected won't be logged out. The ability to enforce a logout upon disconnect (by using SIGHUP or similar mechanism) is still in the roadmap. For Windows there is an automatic timeout enabled in Special Administrative Console (SAC); however, for Linux you can configure the terminal timeout setting. To do so, add export TMOUT=600 in your .bash_profile or .profile file for the user you use to sign in to the console. 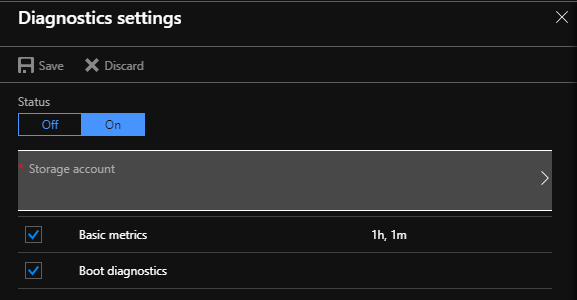 This setting will time out the session after 10 minutes. Accessibility is a key focus for the Azure serial console. To that end, we've ensured that the serial console is fully accessible. Use the Tab key on your keyboard to navigate in the serial console interface from the Azure portal. Your location will be highlighted on screen. To leave the focus of the serial console window, press Ctrl+F6 on your keyboard. The serial console has screen reader support built in. Navigating around with a screen reader turned on will allow the alt text for the currently selected button to be read aloud by the screen reader. Because most errors are transient, retrying your connection can often fix them. The following table shows a list of errors and mitigations. Unable to retrieve boot diagnostics settings for <VMNAME>. To use the serial console, ensure that boot diagnostics is enabled for this VM. Ensure that the VM has boot diagnostics enabled. The VM is in a stopped deallocated state. Start the VM and retry the serial console connection. The VM must be in a started state to access the serial console. You do not have the required permissions to use this VM with the serial console. Ensure you have at least Virtual Machine Contributor role permissions. The serial console access requires certain permissions. For more information, see Prerequisites. Unable to determine the resource group for the boot diagnostics storage account <STORAGEACCOUNTNAME>. Verify that boot diagnostics is enabled for this VM and you have access to this storage account. The serial console access requires certain permissions. For more information, see Prerequisites. Web socket is closed or could not be opened. You may need to whitelist *.console.azure.com. A more detailed but longer approach is to whitelist the Microsoft Azure Datacenter IP ranges, which change fairly regularly. A "Forbidden" response was encountered when accessing this VM's boot diagnostic storage account. Ensure that boot diagnostics doesn't have an account firewall. An accessible boot diagnostic storage account is necessary for the serial console to function. We're aware of some issues with the serial console. Here's a list of these issues and steps for mitigation. Pressing Enter after the connection banner does not cause a sign-in prompt to be displayed. For more information, see Hitting enter does nothing. This issue can occur if you're running a custom VM, hardened appliance, or GRUB config that causes Linux to fail to properly connect to the serial port. Serial console text only takes up a portion of the screen size (often after using a text editor). Serial consoles do not support negotiating about window size (RFC 1073), which means that there will be no SIGWINCH signal sent to update screen size and the VM will have no knowledge of your terminal's size. Install xterm or a similar utility to provide you with the resize command, and then run resize. Pasting long strings doesn't work. The serial console limits the length of strings pasted into the terminal to 2048 characters to prevent overloading the serial port bandwidth. Serial console does not work with a storage account firewall. Serial console by design cannot work with storage account firewalls enabled on the boot diagnostics storage account. Q. How can I send feedback? A. Provide feedback by creating a GitHub issue at https://aka.ms/serialconsolefeedback. Alternatively (less preferred), you can send feedback via azserialhelp@microsoft.com or in the virtual machine category of https://feedback.azure.com. Q. Does the serial console support copy/paste? A. Yes. Use Ctrl+Shift+C and Ctrl+Shift+V to copy and paste into the terminal. Q. Can I use serial console instead of an SSH connection? The serial console doesn't have as much bandwidth as SSH. Because it's a text-only connection, more GUI-heavy interactions are difficult. Serial console access is currently possible only by using a username and password. Because SSH keys are far more secure than username/password combinations, from a sign-in security perspective, we recommend SSH over serial console. Q. Who can enable or disable serial console for my subscription? A. To enable or disable the serial console at a subscription-wide level, you must have write permissions to the subscription. Roles that have write permission include administrator or owner roles. Custom roles can also have write permissions. Q. Who can access the serial console for my VM? A. You must have the Virtual Machine Contributor role or higher for a VM to access the VM's serial console. Q. My serial console isn't displaying anything, what do I do? A. Your image is likely misconfigured for serial console access. For information about configuring your image to enable the serial console, see Serial console Linux distribution availability. Q. Is the serial console available for virtual machine scale sets? A. At this time, access to the serial console for virtual machine scale set instances isn't supported. Q. If I set up my VM by using only SSH key authentication, can I still use the serial console to connect to my VM? A. Yes. Because the serial console doesn't require SSH keys, you only need to set up a username/password combination. You can do so by selecting Reset password in the Azure portal and using those credentials to sign in to the serial console. Use the serial console to access GRUB and single user mode. Use the serial console for NMI and SysRq calls. Learn how to use the serial console to enable GRUB in various distros. The serial console is also available for Windows VMs. Learn more about boot diagnostics.